Okay it’s not really a bowl since I put it on a plate but I think you get the idea. This is one of my favorite ways to have dinner. Pile a bunch of delicious things together, top it off with a really flavorful sauce and go to town. 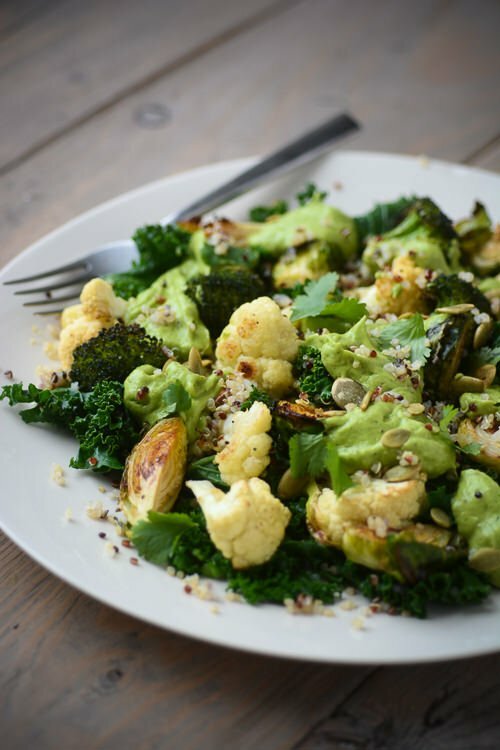 Today my ideal dinner consisted of some steamed kale, roasted veggies, and quinoa topped off with a super flavorful avocado cilantro cream. The amount of the veggies is up to you, if you add a lot more you should use a little bit more olive oil so you get some nice browning. You could also easily swap out some squash or fennel or swap out the kale for some spinach instead. 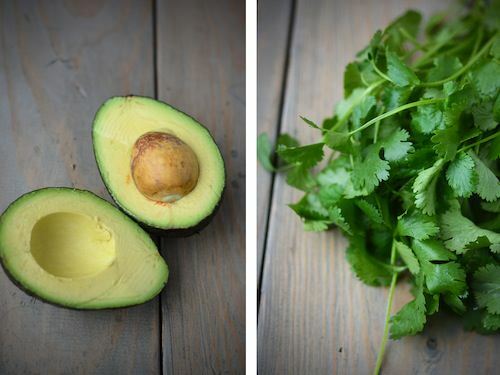 If you aren’t a big fan of cilantro, try parsley or basil instead. I loved the addition of the pumpkin seeds for a little pop of flavor and crunch. 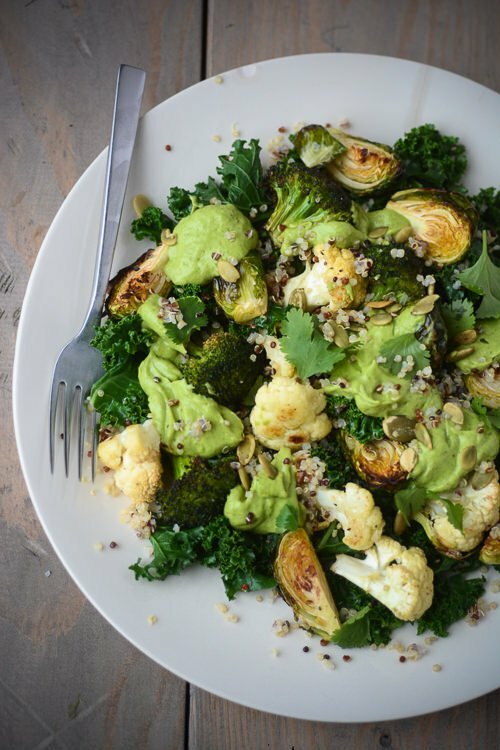 Featuring my favorite winter veggies, this plate is topped with a delicious avocado cilantro pesto. Rinse the quinoa a few times in cold water and then place in a small saucepan with 2 cups of water and a ¼ teaspoon of salt. Bring to a boil and then reduce the heat to medium, cover and cook for 12-15 minutes. Remove from the heat and let sit covered for 10 minutes. Fluff the quinoa with a fork and set aside while preparing the rest of the dish. 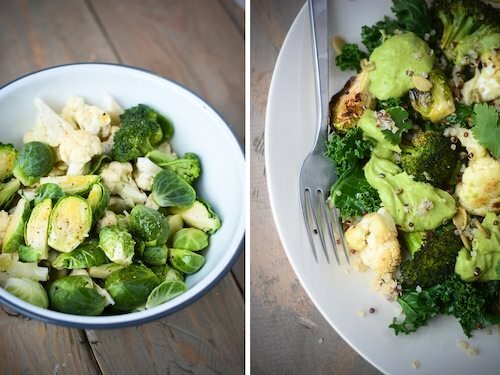 Pre-heat the oven to 400 degrees F. On a baking sheet lined with parchment toss the cauliflower, broccoli and brussels sprouts with the tablespoon of olive oil. Season with salt and pepper and roast for 15 -20 minutes, stirring once or twice until the vegetables start to brown. Fill a large pot with a lid with ½ inch of water and set a steamer basket in the center. 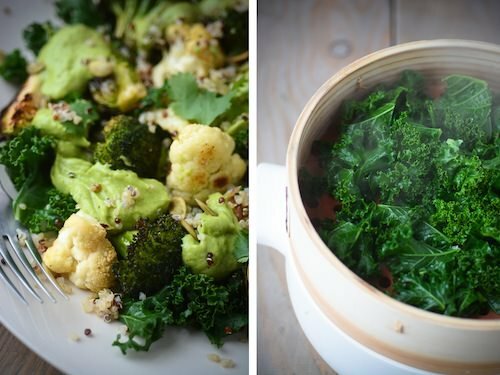 Bring the water to a boil, add the kale, cover and cook for 5 - 7 minutes until the kale has softened and turned bright green. To make the sauce add all the ingredients to a blender or food processor and process until smooth. Taste and add more salt if needed. This looks fabulous!! And I can see how the pumpkin seeds are a nice crunchy addition. A perfectly well-rounded meal. But I must ask, Tina…You once mentioned your husband/son like meat with most meals. You appear to effortlessly eat what you like despite this, so how do manage to also accommodate their different tastes without it being too much extra effort at night? Also love your Minimal Mondays feature. I love a meal where I can just throw a whole bunch of things together. I like to play with different textures and flavors and try and get them all to meld together! I made this for dinner. I knew it would be good because I believe that Brussels sprouts roasted with olive oil and salt are pretty much God’s food. We have spinach growing in the garden so I used that instead of the kale. Delicious. I totally agree with you. 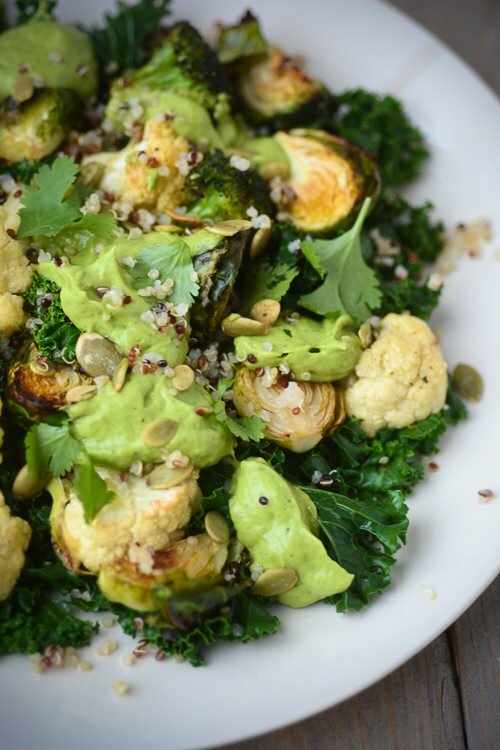 I could live happily ever after with a bowl of roasted brussels sprouts. Have you ever tried sprinkling them with a little fish sauce before you roast them? Amazing!